^ Rusbridger, Alan (29 May 2015). "'Farewell, readers': Alan Rusbridger on leaving the Guardian after two decades at the helm". The Guardian. Retrieved 29 May 2015. ^ "Can the Guardian survive?". Intelligent Life. July – August 2012. ^ "Key moments in the Guardian's history: a timeline". The Guardian. 16 November 2017. Retrieved 3 April 2018. ^ Staff, Guardian (14 September 2011). "Guardian News & Media press release: Guardian unveils US url". The Guardian. Retrieved 22 July 2013. ^ "Oral or Written Questions for Answer beginning on Wednesday 14 October 2009". UK Parliament. Archived from the original on 16 October 2009. ^ "Support the Guardian". support.theguardian.com. Retrieved 3 August 2018. ^ "Could The Guardian's quest for philanthropic support squeeze out other news nonprofits?". Nieman Lab. Retrieved 6 August 2018. ^ Center, Foundation. "Guardian Announces Launch of U.S. Nonprofit". Philanthropy News Digest (PND). Retrieved 6 August 2018. ^ "OPP1034962". Bill & Melinda Gates Foundation. Retrieved 8 August 2018. ^ Greenslade, Roy (17 March 2003). "They've lost the battle, will they support the war?". The Guardian. ^ Editorial (13 August 2015). "The Guardian view on Labour's choice: Corbyn has shaped the campaign, but Cooper can shape the future". The Guardian. ^ Editorial. "The Guardian view on the election: it's Labour". The Guardian. ISSN 0261-3077. Retrieved 19 September 2018. ^ Chadwick, Paul (28 June 2017). "Flawed reporting about WhatsApp | Open door | Paul Chadwick". the Guardian. Retrieved 18 January 2018. ^ Ganguly, Manisha (13 January 2017). "WhatsApp design feature means some encrypted messages could be read by third party". the Guardian. Retrieved 18 January 2018. ^ Monbiot, George (15 August 2018). "We're in a new age of obesity. How did it happen? You'd be surprised | George Monbiot". The Guardian. ISSN 0261-3077. Retrieved 10 March 2019. ^ "George Monbiot blames the government for rising obesity levels – there's a simpler explanation". Spectator Health. 15 August 2018. Retrieved 10 March 2019. ^ "George Monbiot says obesity is an 'incurable disease'. Here is what's wrong with his evidence". Spectator Health. 12 August 2015. Retrieved 10 March 2019. ^ Corrections; editor, clarifications column (9 December 2018). "Corrections and clarifications". The Guardian. ISSN 0261-3077. Retrieved 10 March 2019. ^ "Print ABCs: Metro overtakes Sun in UK weekday distribution, but Murdoch title still Britain's best-selling paper". Press Gazette. 15 June 2017. Retrieved 11 July 2017. ^ Letters (15 July 2018). 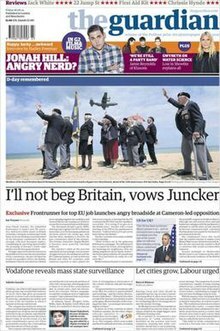 "We've got the Guardian masthead blues and we're overjoyed | Letters". The Guardian. ISSN 0261-3077. Retrieved 18 January 2019. 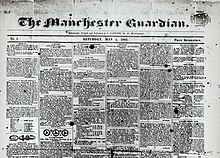 ^ "Guardian.co.uk most read newspaper site in UK in March". www.journalism.co.uk. 30 May 2013. Retrieved 17 June 2014. ^ Edge, Abigail (2 December 2014). "Ophan: Key metrics informing editorial at the Guardian". Journalism.co.uk. ^ editor, Corrections and clarifications column (8 March 2011). "Corrections and clarifications". The Guardian. Retrieved 27 June 2018. ^ office, GNM press (27 February 2018). "The Guardian wins seven Sports Journalists' Association awards". The Guardian. ISSN 0261-3077. Retrieved 23 January 2019. ^ "2013 British Sports Journalism Awards – Sports Journalists' Association". Retrieved 23 January 2019. ^ sport, Guardian (27 February 2017). "Double honours for Daniel Taylor as the Guardian wins four SJA awards". The Guardian. ISSN 0261-3077. Retrieved 23 January 2019. ^ "2014 British Sports Journalism Awards – Sports Journalists' Association". Retrieved 23 January 2019. ^ "2015 BRITISH SPORTS JOURNALISM AWARDS – Sports Journalists' Association". Retrieved 23 January 2019. This page was last edited on 20 April 2019, at 04:48 (UTC).